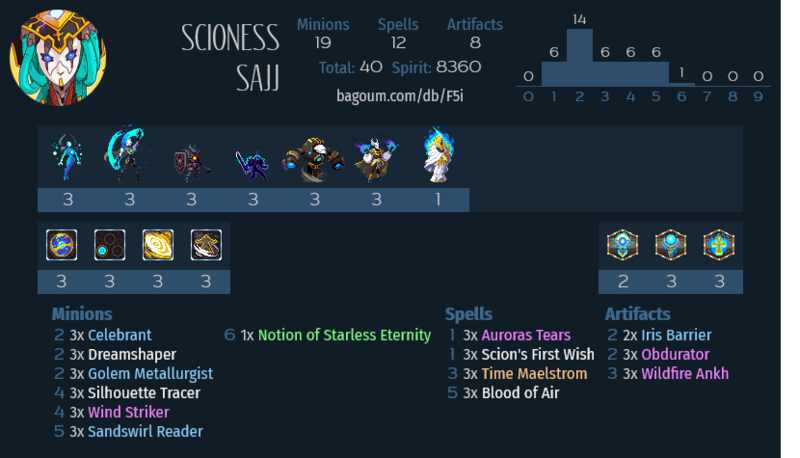 I saw that the NoSE deck on this site were rather few, since I’ve played this archetype a little I thought I’d provide a list here for any aspiring Ascendants. The list I like to play actually forgoes the Golem package to buy in to the One Woman Army dream, but I do concede that the Golem package is really very strong, particularly when you do actually want to play Wind Striker. So this is my take on a Golem/Tears/NoSE hybrid list. As I alluded to at the end of that last paragraph you’ve got a few options for how to play out the game, and it’ll often depend on the matchup and the tools you have in hand how best you’ll procede. Got an Obdurator and a Tracer against Vaath? do the trial. Got Tears/Maelstrom/Ankh/Striker? maybe you could set up the 1 shot combo. Drew the Golem highroll opener? slap it on the table. The nice thing about having NoSE is that it’s always a threat that you could acquire the destiny, and your opponent will usually have to respect that, even if you have no intention of winning with it, they’ll play differently to block it off, and it often means you have a backup win condition for if they wipe your board or heal out of combo range etc. As the list is honestly on the weaker side conventionally, you’ll have to get a feel for what you can do and what the best line of play to navigate a win is, you can’t just thoughtlessly jam out whatever on curve while hitting enemy face non-stop in most situations. You will have all your artifacts deleted by Flash EMP, Bloodrage Mask, Decispikes and more. You will get slaughtered by Flameblood, Void Pulse, Void Pulse. You will lose because your opponent played every provoke minion under the sun. But when you Ascend, get celerity and kill the enemy from full HP blasting them from all 4 directions just to style on ’em, well it all feels worth it. The deck is built because this card exists. It doesn’t matter if someone tells you you could build a better deck without it, because you want to play it. And you are right to, Ascending is fun and powerful. Unfortunately dropping this bad boy does have a bit of a requirement, and not just the trial, which can take a bit of effort to achieve, but then you also need to find time to drop a 6 mana 3/3, THEN you need to suit up a full 3 artifacts to achieve the full effect. But often just Flying and/or Frenzy is enough to have some important use. You may often have an artifact equppied when you play it, so in those situations it will grant you Frenzy to help clear board a little right away, and at 2 Flying can get you out of a bind. Celerity is of course the most powerful keyword and only achieved at stage 3. It can be used to hit and run, or works as a powerful finisher. Overall NoSE works to be a powerful possibile win condition in the deck that you can leverage to your advantage, but is not the only way to win. Another way to win is to just combo a bunch of artifacts to boost your Tears, then double dip the attack buff for a OHKO. Worth noting that this works well before completing the trial but really goes nuts if you have celerity as you get 4 attacks off of the reactivation. These cards can also pull their weight outside of a combo to clear off a large minion or burst with Tears and multiple small ones or get some mobility with Maelstrom. It is most satisfying to combo them together though, but that they have occasional uses outside of that makes me pretty happy to recommend them. It’s undeniable that the Golem package is a little overtuned. You can get multiple bodies on the board for cheap and Dreamshaper in particular is really nice to draw back up for more gas or options. The draw is slightly weaker in NoSE as your handsize is capped at 1 less for much of the game so look out for that. The upside is that we’re really happy to run Wind Striker as it’s pretty comparable to Staff, but with a Metallurgist it’s only a mana more to get a flying 1/4, which benefits really nicely from a first wish and also enables the Bond for Dreamshaper. You honestly could happily run a different package here, and I have, but the Golems are a pretty solid option that is hard to say no to. We need enough artifacts to complete the trial and get fully ascend. These are my choices, they are good pretty much from the opening turns right up until the end game, (though Ankh and Barrier don’t really mix). I don’t like Autarchs as it always gives garbage and would rather hold onto a nice set of equipment in hand if I want to reach tier 3. It often makes sense to do this as your opponent will often clear whatever you do equip if you’re going for a trial win, so having some inexpensive ones to equip all at once is nice for both trial and Tears/Maelstrom Combo (it is also why Y’kir over Striker is nice in non-golem builds). But all of these work for being useful to equip at almost any point in the game so that you can threaten to finish the trial at any moment if your opponent doesn’t stop you. And this is a key card that let’s us threaten that. I used to like Neurolink when NoSE cost 5, as you could do the trial super early, but at 6 mana you’re often left standing around for a few too many turns and the clunkiness of running Lark and Link is usually a Busted Flush. Tracer is nice as it lets you not only finish trial, but also hit backline threats and escape from incoming burst or provokes. Too good and staple to not include. If you’re not finding the Golem package to butter your bread you can change it out. If you want to go faster and more into the Artifact Solo style Lost Artificer & Y’kir are nice. People also have claimed to have success with Atom Klinger. If you need more healing Azure Herald is a solid option. If you cut enough minions 1st Wish may become too situational. Also an option is to cut NoSE entirley and run more into the Tears Combo or perhaps and Aggro slant with Falcius and Flameblood. Running Lost in the Desert or Stars Fury keeps people on their toes if they spread out to stop your Flying escape. But if you really want to trip people up consider Superior Mirage. I also like Boneswarm as a general purpose removal/artifact breaker, though if you want the latter Rasha’s Curse is better. I have also tried running Ciphyron in this kind of list actually and it’s not bad, but Sajj is not only cooler, she also deals with serious threats better, where Ciph sorta always has small continuous utility. you’re welcome to try him. Anyway, if you run this deck or something I wish you all the best.